Journey's End: Exploring Grand Canyon, Death Valley & Yosemite National Parks — 2checkingout | travel and adventure | Inspiring. Capturing. Experiencing. The final leg of our road trip had us leaving behind the Mars landscape of Utah and heading into the flat plains and meadows of northern Arizona. 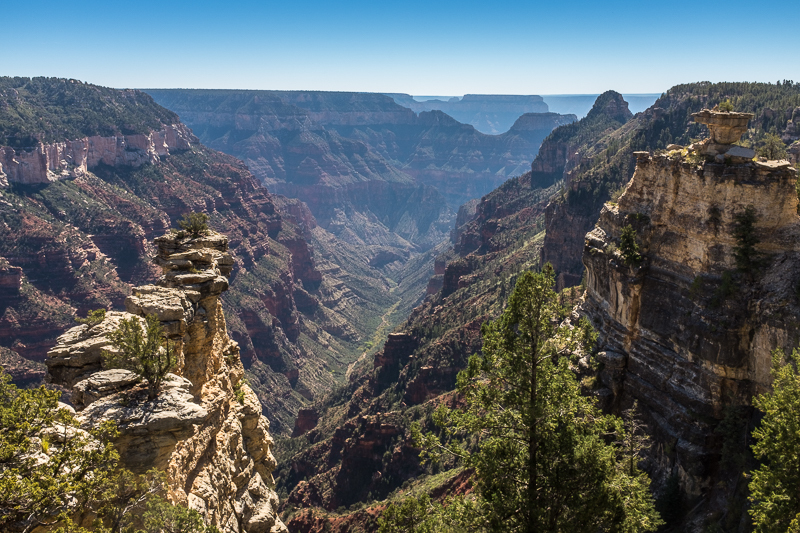 Given that there was a rock the size of a small truck blocking the tunnel out of Zion National Park, we had to take a slight detour to get to the Grand Canyon North Rim. 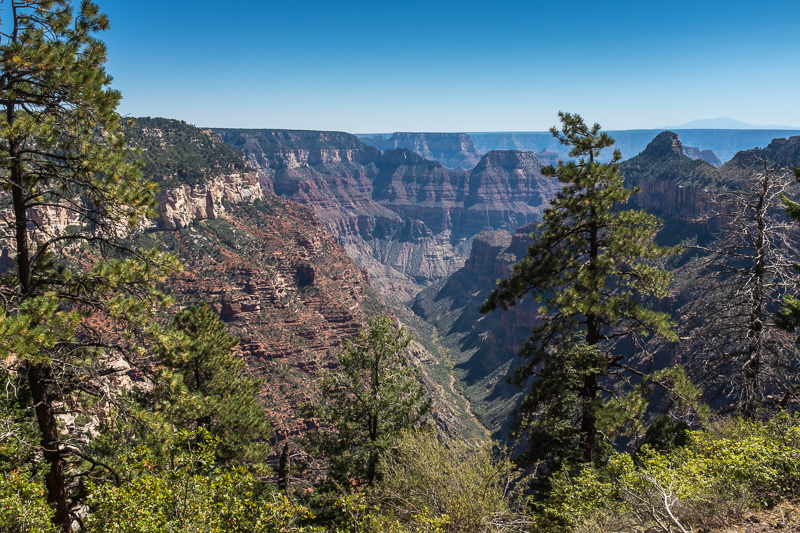 Rather than visiting the touristy South Rim of the Grand Canyon we opted for the North Rim. Not sure why, but the Canyon was not high on our priority list so we only allocated one full day in the park. We found an uninspiring campground at Jacob’s Lake 40 minutes north where the only highlight was the yummy treacle thick milkshake served up at the local store. Canyon day, we were up early and had the road to ourselves. Mule deer peeked out of the woods and a herd of bison emerged from the fog blanketed meadows. The first stop was Point Imperial the highest spot of the North Rim. One lucky couple were having a romantic breakfast with the most dramatic back drop. From there we made our obligatory visitors centre stop to figure out how we would spend our day. 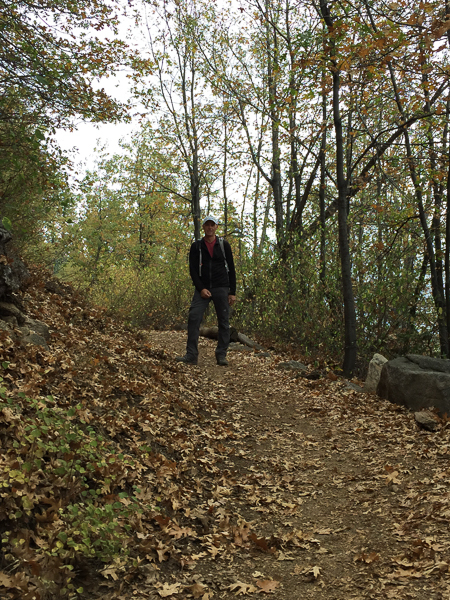 Instead of heading down into the canyon, we chose the Widforss Trail. 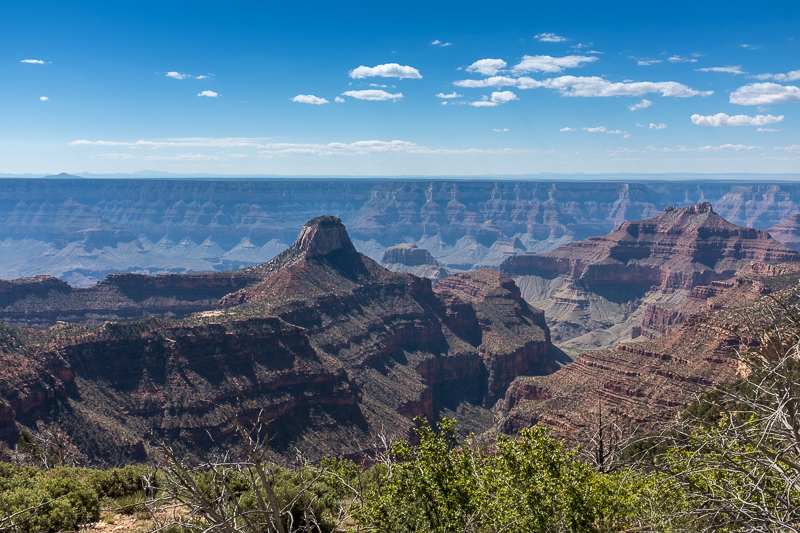 This 10-mile round trip starts at the rim. The first mile hugs the canyon lip offering up stunning views of layers of time captured in the canyon walls. Then you descend through the spookily quiet forest, all the time looking out for the elusive white-tailed Kaibab squirrel. Cutting through colourful meadows before emerging at the rim again at Haunted Canyon. It’s a beautiful walk and early morning we had the trail to ourselves. There were a few people at the trail lookout but not a speck of the crowds that are common on the opposite side of this vast crack in the earth. Unique to this forest, the squirrels proved to be quite camera shy, but we did spot a few. 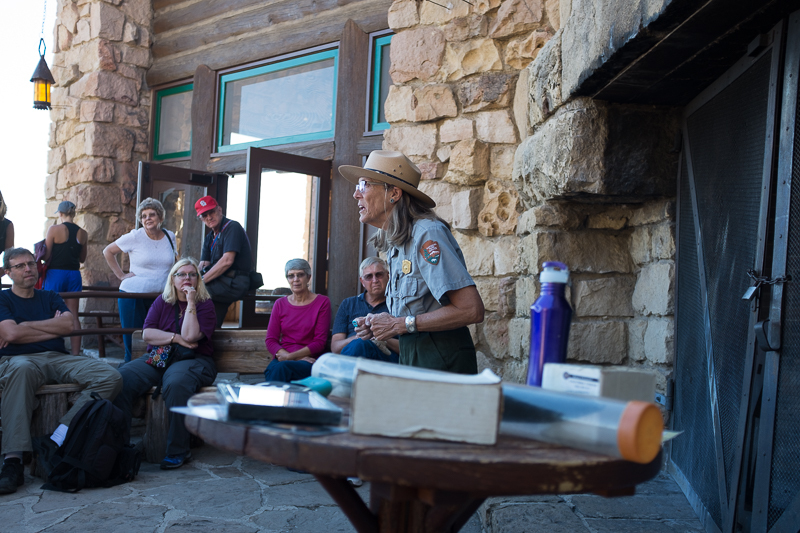 We started to melt on the walk back as the temperature climbed close to 40ºC or 103º F.
Arriving back at the Grand Canyon lodge late afternoon we timed it perfectly for a ranger talk. This talk given by a passionate lady was all about the rare Californian Condor. Just a few years ago, on the brink of extinction, a decision was made to capture the remaining wild birds and start a captured breeding programme. Today, many juvenile birds have been successfully reintroduced back into the wild. An inspiring talk delivered by a great story teller. Anybody seen a Californian Condor? 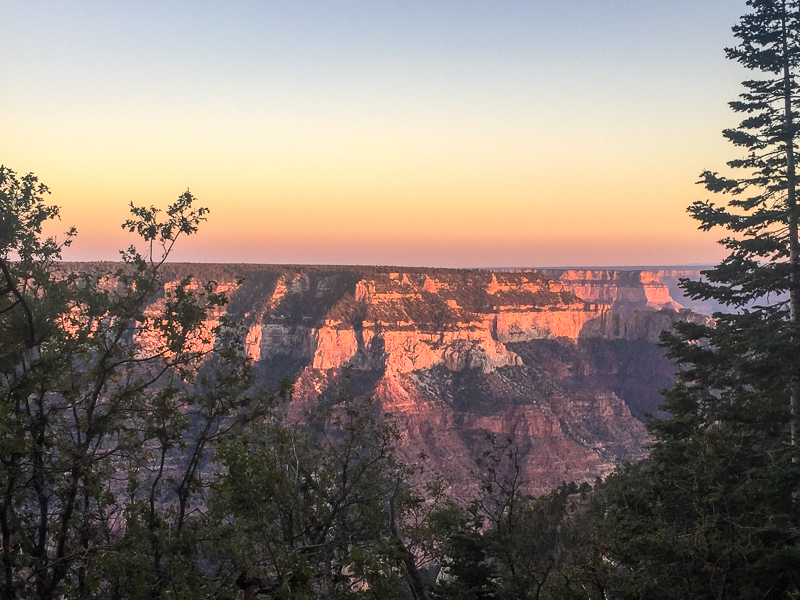 The lodge also provides the perfect place to capture the sunset over the canyon. For the less adventurous, the lodge has massive picture windows. 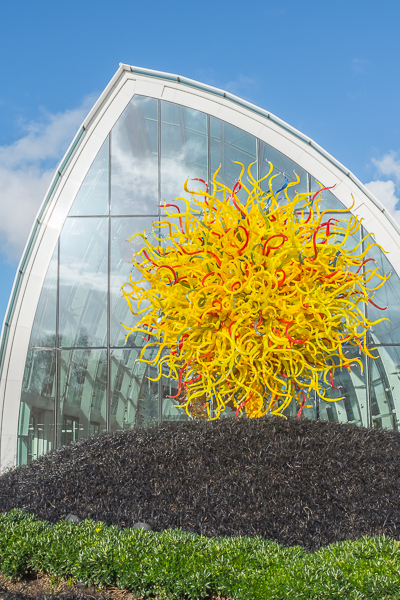 Step outside and there are a couple of vantage points to snap that killer photo. So that was the Grand Canyon, maybe next time we should tackle the challenging rim to rim canyon walk. Our next stop should be classified as a National Park. There are certainly some wonderful sights, crazy landscapes, strange inhabitants and rivers of visitors flowing in every direction, Las Vegas. As we had to drive passed, we thought we would spend a couple of days in Sin City. Both of us have visited on several occasions so nothing that Vegas offers was a surprise. Staying at Sam’s Town, we were a short shuttle ride to the action of The Strip. Dinner was at China Poblano in the Cosmopolitan, a fusion of Asian and Mexican and very tasty. We then made the mistake of visiting the Dueling Piano Bar at New York New York. The bar was packed, and the piano players whipped the crowd into a frenzy with mostly American foot stomping classics. Fair to say, we were both dusty the following morning. A good job there were hours of NFL to watch, the perfect remedy for a sore head. Late afternoon we headed over to Fremont St, the historic part of Vegas. Historic as in not built in the last couple of years. The street was eerily quiet; the street performers must have all hibernated for winter. So we spent a couple of hours nursing some very expensive cocktails at the Wynn Hotel overlooking the lake of dreams, complete with artificial pine forest. Yep Sin City National Park. Our route to Yosemite took us through Death Valley National Park. Another one to tick off the list. Our visit was literally a quick stop for lunch and a lookout. An incredible landscape of moulded hills and vast openness. After a full day of driving, we arrived at the edge of Yosemite National Park and found a quiet campsite just before Tioga Peak. 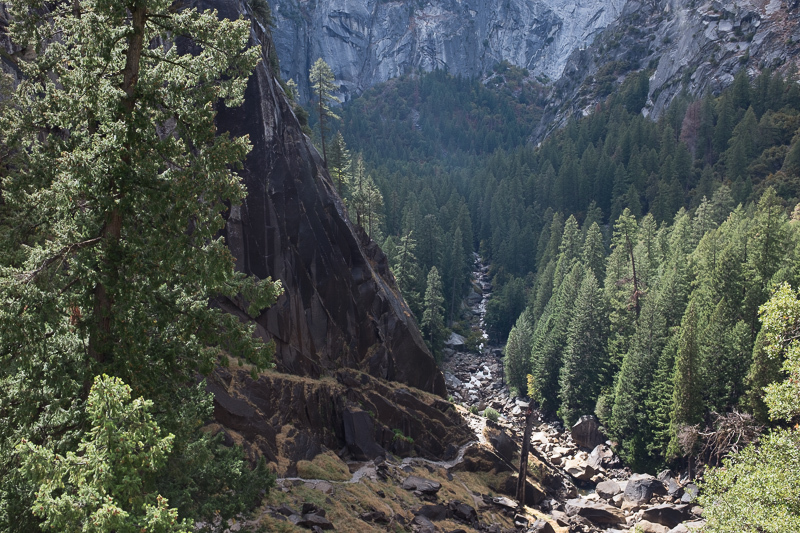 Yosemite, out of all the National Parks, was top of my must visit list. The inspiring photos of Ansel Adams had sparked a burning desire to visit many years ago. The road through Tioga Pass roller-coasted several hundred feet. 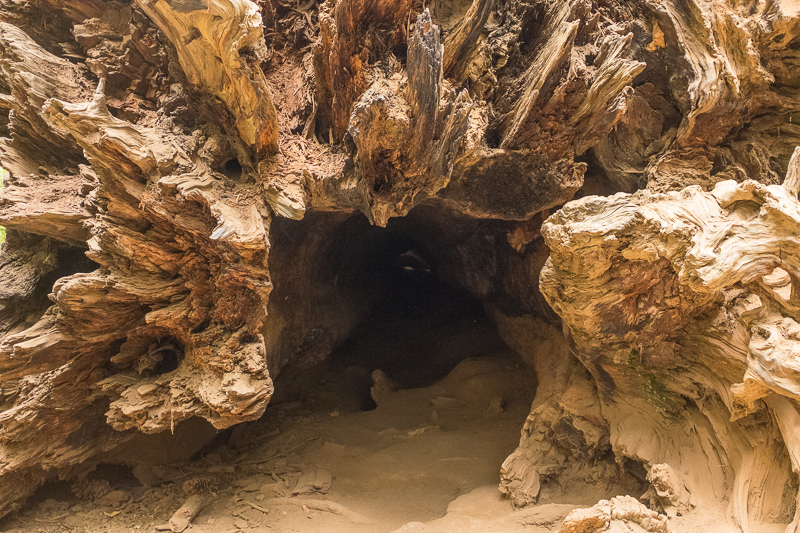 We stopped for a little tree hugging with some of the largest and oldest sequoias in the world. There was even one with a hole in the trunk big enough to drive a car through. Despite being the off season, the park campgrounds in the central valley were full to bursting. Learning our lessons we had booked a space prior. Add to this a huge amount of maintenance work taking place and the gloss was starting to wear off a much-anticipated visit. 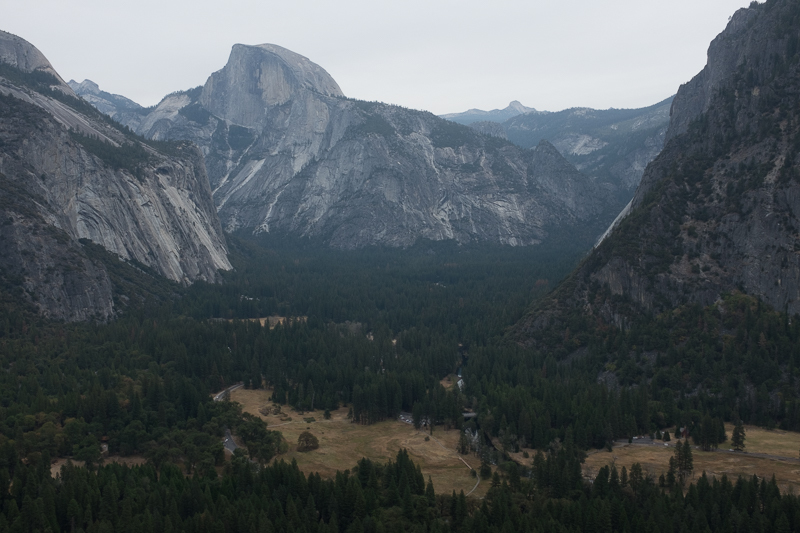 The following day, the last hike on our road trip started with a bus ride from Yosemite Valley to Glacier Point. The 40 minute journey came complete with the most annoying driver commentary you could imagine. If we hadn’t already planned on hiking down we would have had to sabotage the driver’s microphone. We descended through a forest and picked up Four Mile Trail that offered impressive views of Half Dome. 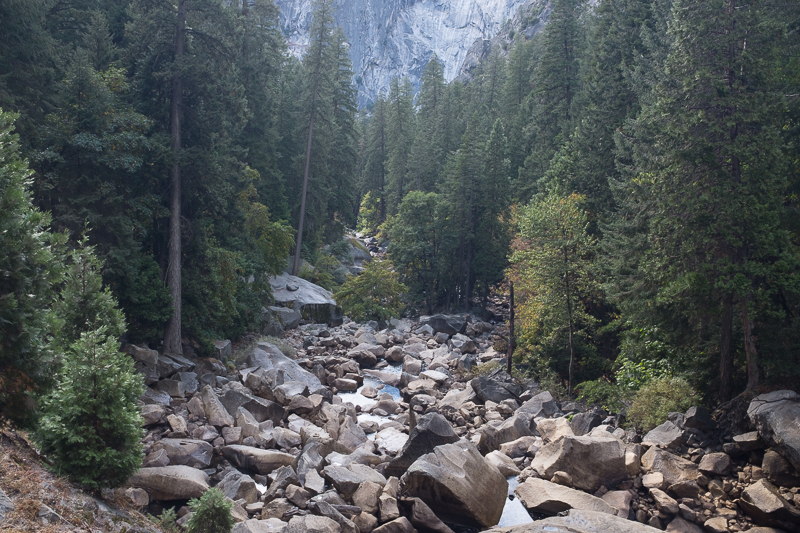 The trail drops 3,200 feet from Glacier Point to the valley floor. The forecast was for heavy rain with occasional thunder but the weather gods were smiling and whilst sun cream was not needed it was dry. That didn’t last long. In the time it took to get our raincoats out of our backpack the clouds engulfed Half Dome. Within minutes, the dry path turned into a stream and we were soaked from head to toe. We were only a third of the way down; boy this was going to be fun. By the time, we reached the bottom of Yosemite Falls the rain had thankfully stopped. We squelched our way passed folks heading uphill to the bottom of the falls. The final leg to the valley floor was steep and knee jarring. We offered words of encouragement to those heading in the opposite direction. The following morning on the way out of the park we stopped to admire the gigantic granite face of El Capitan. Crazy folks were gearing themselves up to tackle this incredible climb. I bet it wasn’t this busy when Ansel Adams whipped out his camera and tripod. So there you have it, after 46 days, 6,600 kilometers (4,100 miles), ten National Parks and five states, our road trip comes to an end. We have had a fantastic time; the parks are all so unique. We have gotten close to some amazing wildlife, seen some mind-blowing landscapes, met some wonderful people and taken enough photos to fill the Grand Canyon. We had walked close to a 650 kilometers (400 miles), and we are still talking to each other, go figure. 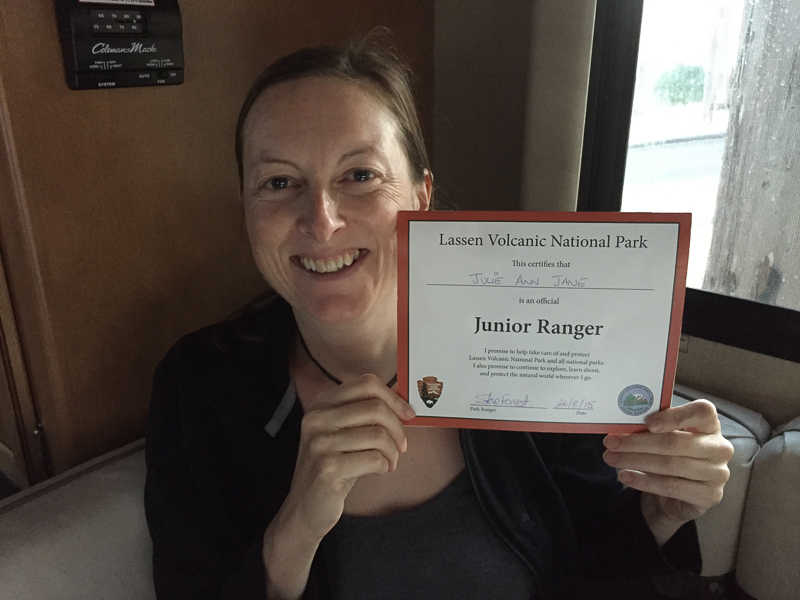 As awesome as this trip has been we would be really pleased to hand back the RV. But, first, we had a couple of days in Trailer Hell and a wedding to attend.